In this paper we present DES14X3taz, a newly discovered superluminous supernova (SLSN). This particular SLSN is very unusual – if you look at the evolution of its brightness over time, or its light curve, there are two peaks (most only have one)! In our analysis, we attempt to explain what physical process might cause such an occurrence and determine if this is truly a unique event or common to all SLSNe. Although the initial DECam data was fairly indicative that this was a particularly interesting object, we had to use additional information to confirm our discovery. 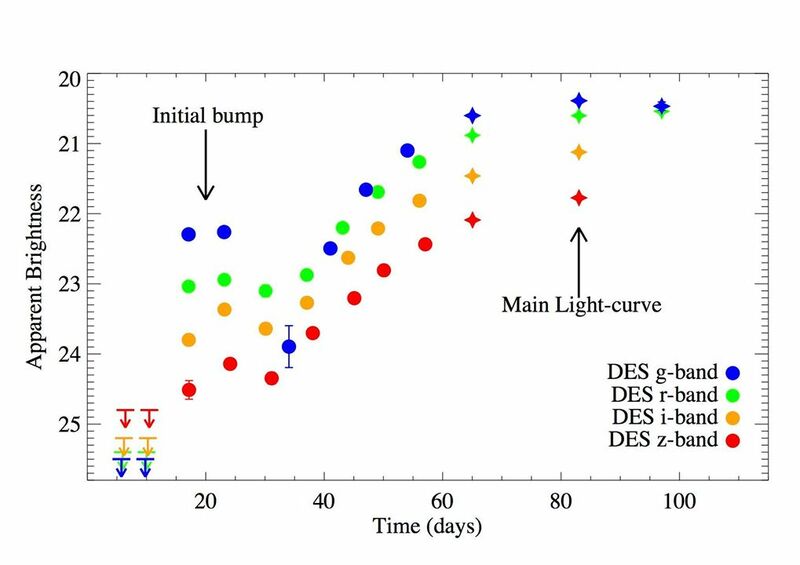 By combining optical light-curve data from DES and its sister survey, the Survey Using Decam for Superluminous Supernovae (SUDSS), we were able to plot the evolution of brightness over time (light-curve) of DES14X3taz and find its brightest point. We then used spectra obtained on the Gran Telescopino Canarias (GTC) in La Palma, Spain to estimate the distance to this event, and thus its peak brightness, and unambiguously confirmed that it is a SLSNe. What really distinguishes DES14X3taz from previously discovered SLSNe is the presence of an early “bump” in the light curve prior to the main light-curve. The figure below shows these features for DES14X3taz. In addition to detecting this bump, we were lucky to have observed this SLSN before explosion and to have observed it at many points during its lifetime; most other observed SLSNe have been discovered post-explosion or do not have such a large a sample of measurements. Our observations with DECam allowed us to obtain colour information, from observations in several filters, of the bump. This enabled us to probe the physical processes driving these super-luminous events by comparing our data to pre-existing theoretical models. In the figure below, the colored-circle points are real data, and the dashed lines represent theoretical observations for different physical processes that we think might be motivating this behavior. 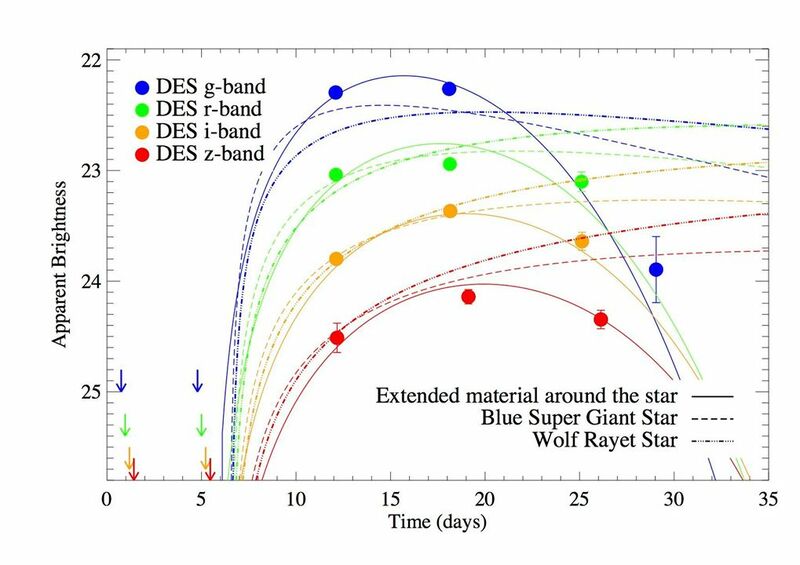 Fitting models to the main curve show that the physical mechanism driving the explosion is consistent with a magnetar, a rapidly rotating neutron star (as seen in the match to the Extended Material Around the Star). In the figure, this is consistent with the solid lines. Fitting black-body curves to the DES data of DES14X3taz, we show that the initial peak cools rapidly, before a period of reheating, which drives the main part of the light-curve. Using chi-squared statistics, we compare photometric data of the initial peak with various models of shock-cooling and find that shock from material at an extended radius is consistent with observations. We also find a sample of previously discovered SLSNe that also exhibit this early bump in their light curves; therefore, we believe our findings suggest a unified physical interpretation for all SLSNe. SLSNe are a new class of transient event, with potentially exciting consequences for cosmology. Recent work (Inserra & Smartt 2014) has suggested that these events may even be “standardisable candles”, and thus useful to measure distances to the high redshift Universe. As these events are more luminous than traditional Type Ia supernovae they have the potential to extend SN cosmology to larger distances than currently possible. However, little is well-understood about the explosion mechanism driving these events and we will need to understand more about the origin of SLSNe as we explore utilizing them as cosmological probes. 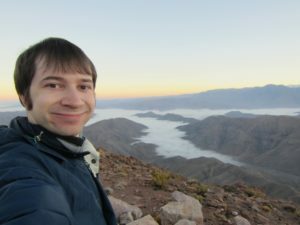 Mathew Smith is a post-doc working at the University of Southampton. He’s been involved in DES for the past ~5 years; first in Cape Town as a post-doc focussing on spectroscopic followup! 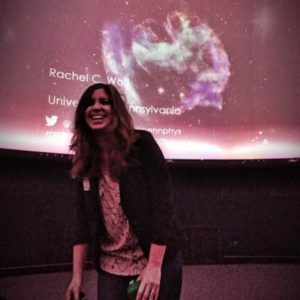 Rachel C. Wolf is an astrophysics PhD candidate at the University of Pennsylvania. She is primarily interested in how to best use Type Ia supernovae to understand more about the evolution of our universe. Most of her work has focused on studying correlations between supernova brightness and host-galaxy properties and on creating new statistical techniques to compare observational data to cosmology theory. Rachel is also very passionate about science education and public outreach. She is involved in many projects in the Philadelphia community and serves as one of the co-coordinators of Education & Public Outreach for DES.